Could this be the bike that Mark Cavendish pilots to Giro d’Italia and Tour de France stage wins and – perhaps – Olympic road race victory in 2012? Cavendish’s Team Sky liveried Pinarello Dogma 2 is a very subtle affair. The black frame features white decals and blink-and-you’ll-miss-them rainbow stripes on the seat stay to celebrate the Manxman’s road race world title. The bike is equipped with Shimano’s electric Dura-Ace Di2 groupset to give the sprint ace crisp shifts all the way to the line. Shimano also supplies its Dura-Ace C35 wheels. This season, Sky has switched from Deda components to PRO – and Cavendish’s bike features PRO stem and handlebars. The saddle is provided by Fizik. Cavendish moved to the Sky team from the now disbanded HTC-Highroad outfit, where he rode a Specialized Venge during the 2011 season that saw him become the first British rider to secure the green jersey at the Tour de France, followed by a win at the road race world championship in Copenhagen. 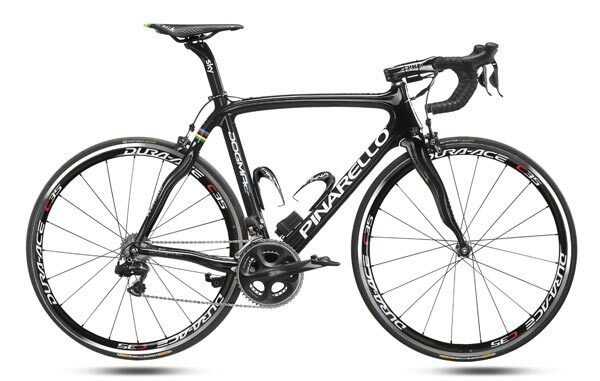 Cavendish is likely to give his new Pinarello its first competitive airing at the Tour of Qatar starting on February 5. The Pinarello Dogma 2 frameset alone retails for around £4,000.